What if this Tammi Terrell biography completely excised the health and personal troubles? Made the tale of her life a happy, music-centered one for once? As for her Motown duet partner, Marvin Gaye, that would be nice. But nothing but the real thing (as far as anyone knows it) will do here. Thomasina Montgomery first entered existence on April 29, 1945. Around age 8, Tommy saw some performers at Philadelphia's Uptown Theater and decided that she, too, would become a star. With support from her barber dad and actress mom, the dancer, pianist, and singer prevailed in local talent contests at home and in New Jersey by the time she turned 11. Like a true celebrity, she altered her name to "Tammy" as a teen. With the skills to back up that status, she opened for Patti LaBelle and the Bluebelles and other big shots in clubs. It was 1960 when Tammy Montgomery seized producer Luther Dixon's offer of a Scepter Records deal. Her voice graced Shirelles demos as well as her own singles, like "If You See Bill" and, at the Wand label, "Voice of Experience." While she certainly had the voice, the experience part of the Tammi Terrell biography came with James Brown, who spied her at the Uptown Theater. He may as well have said, "Try me!" Indeed, on that label, she recorded singles like 1963's "I Cried." She also sampled life as an R&B backup singer with Brown's Revue and, apparently, as his girlfriend. Parental disapproval triggered the end of both the relationship and the job. In 1964, Tammy Montgomery balanced her showbiz desires with more practical but no-less-ambitious pre-med studies at the University of Pennsylvania. After releasing "If I Would Marry You" from Checker, she changed her surname to "Terrell." Not because she wed boxer Ernie (brother of future Supreme Jean), but probably because it was shorter and sounded less country and more R&B-worthy. So it was Tammi Terrell that Berry Gordy wanted at Motown in 1965, following her performance with Jerry Butler at Detroit's Twenty Grand Club. Producers Johnny Bristol and Harvey Fuqua worked with her first. "I Can't Believe You Love Me" did well at #25 R&B. Without pop action, though, Motown could have very well cut its ties. It stayed patient throughout "Come on and See Me," a cover of "This Old Heart of Mine," "Hold Me, Oh My Darling," and other nonstarters. Time to meet the second-most prominent figure of the Tammi Terrell biography. When Marvin Gaye ended up partnerless (again, after Mary Wells) with Kim Weston's departure in 1967, Fuqua thought a certain female solo singer could do well with him. 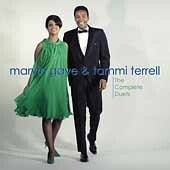 Tammi Terrell, Marvin Gaye, lyricist Nickolas Ashford, and composer Valerie Simpson made a peerless R&B team. "Ain't No Mountain High Enough." "Your Precious Love." "Ain't Nothing Like the Real Thing." "You're All I Need to Get By." Etc.! Fans loved the duets as much as the singers loved each other (platonically, by most accounts). Those songs also finally brought Terrell the fame she'd been dreaming of since childhood. Yet that same year, a nightmare had begun to unfold. First, the terrible migraines. Then, her collapse during a Hampton University show in Virginia. Then, the discovery of a malignant brain tumor. More "thens" would get us to the unhappy end of this Tammi Terrell biography quickly. The songstress herself had no such option. This funny, attentive free spirit weakened slowly and painfully--unbeknownst to the public. How? Engineers overdubbed Gaye's vocals onto some old Tammi tracks for You're All I Need. More ghoulishly, Valerie Simpson impersonated Terrell on Easy's songs, which included "Good Lovin' Ain't Easy to Come By," "What You Gave Me," and "The Onion Song." The setup appalled Gaye. But as Motown contended, an album under his partner's name meant income for her family. Fans knew nothing about this ploy. They did, however, suspect that something was amiss about Tammi Terrell's condition. The rumor mill churned so furiously that Temptation David Ruffin had to come out to assuage them. What he didn't address--and what remains unclear to this day--was whether he, as her boyfriend, or a Motown executive had caused her head traumas. Terrell's affairs with men were reportedly quite volatile. With her own alleged drinking problem, she was no sheltered mouse. But no one deserved to endure extremes in weight, partial paralysis, and eight operations that ultimately failed. Especially someone so young. That youth is forever part of her tragedy--frozen at age 24 after March 16, 1970. The facts of her life (whether we know them for sure or not) won't change. So let's return to the more hopeful beginning of this Tammi Terrell biography. She'd wanted to be a star, someone brilliant and beloved. You can't deny that she got her wish. 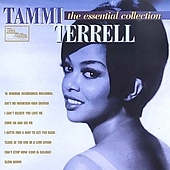 Hungering for more Motown oldies content like this Tammi Terrell biography? The homepage may have the bios you want.